FAYETTEVILLE, N.C. – For the first-time in Fayetteville Marksmen professional hockey club team-history, they play past game number 56, as they’ve officially made it to the Southern Professional Hockey League Post-Season. 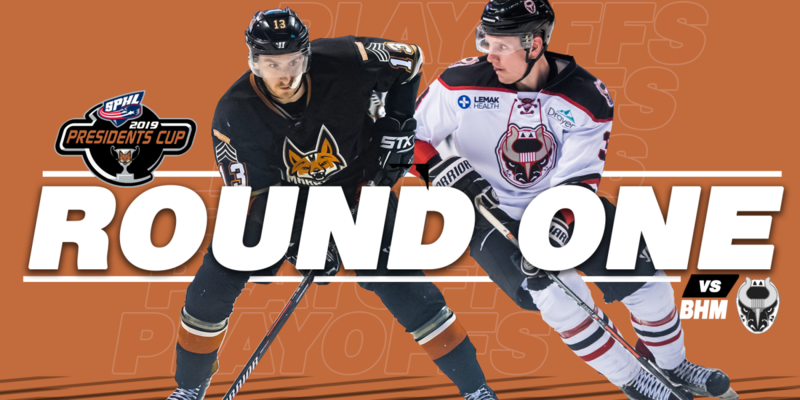 The SPHL operates Round One of the playoffs with a unique-format (in its second year) known as the “Challenge Round”, where the top four seeds pick their opponent from the bottom four seeds for a best-of-three series. #2 Birmingham used its pick on the #8 Marksmen. An interesting note in the battle against Birmingham is the history. Both of these teams, in their first-year last year, finished in the basement of the SPHL Standings – Birmingham as #9, and Fayetteville as #10. Now in year two, both teams have seen a phenomenal turn-around that has lead them to their first playoff-appearance. The season-series between these two teams has proven to be a physical, intense one all-season-long, and nothing less can be expected when the puck drops for the do-or-die three-game series. All the action kicks off in Fayetteville on Friday, April 12 at 7:00 P.M. for Game One at the Crown Coliseum. With home-ice advantage for the first-game, the Marksmen have a serious chance at stealing a win before heading down to Birmingham for games two & three (if necessary). Following the game, fans are invited to head to ice level for an open-skate for just $5 (incl. skate rental, if needed). Skate supplies are limited, so fans are recommended to bring their own. After the game, the Marksmen and Bulls will race back to Birmingham in preparation for Game Two on Saturday, April 13 at 8:00 P.M. (EST), and Game Three (if necessary) on Sunday, April 14 at 8:00 P.M. (EST). Both these games can be seen LIVE at On-After Sports Bar & Grub at our Home Away From Home Watch Party, on SPHLlive.com ($), or live-audio can be heard for free on MarksmenRadio.com with the Voice of the Marksmen, Shawn Bednard.